Raumfahrt+Astronomie-Blog von CENAP - Blog: Astronomie - Have We Mismeasured the Universe? In the beginning, all of space rang like a bell. The ringing happened everywhere, so intensely that we can still sense it 13.8 billion years later. It has been detected directly in the cosmic microwave background, the afterglow left over from the big bang’s fading fireball, and it has been closely analyzed via the same basic physics used to study the structure of the sun. In fact, the primordial reverberation is so well measured and modeled that it has been used to deduce the precise rate at which the universe is expanding, a number known as the Hubble constant. That constant, in turn, is the cornerstone of our modern understanding of the size, age and structure of the cosmos. 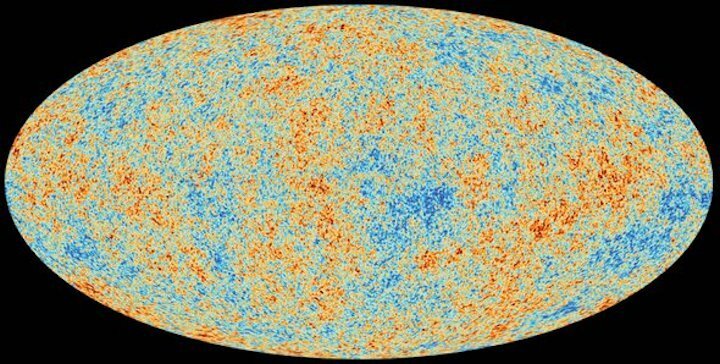 In 2015 a huge team led by George Efstathiou of the University of Cambridge crunched microwave measurements from the European Space Agency’s Planck spacecraft and revealed the universe’s vital stats. Their results indicated the universe is expanding at a rate of 67.8 kilometers per second per megaparsec (a “megaparsec” being a unit of distance equal to 3.26 million light-years). Cosmologists typically drop that mouthful at the end and simply say that the Hubble constant is between 67 and 68. Meanwhile competing groups of astronomers have been studying the expansion of the universe in a distinctly different way, by seeking out variable stars or supernova explosions of known distance and then directly measuring how quickly they are moving away from us. This “distance ladder” method is trickier than it sounds. Reckoning distances across many millions of light-years is a subtle, time-consuming task plagued with the possibilities for many kinds of systematic errors. Get the location of a star wrong, and the entire calculation goes awry. “Every time you increase the accuracy, you have to get to a new level with the systematics. That’s what keeps me awake at night,” says Wendy Freedman of the University of Chicago, who has been laboring away on the Hubble constant problem for more than three decades. By steadily beating down on the uncertainties and drawing on the latest observations of variable stars, her group has come up with its own high-precision answer for the constant: 73.2—and therein lies the controversy. “It’s spectacular progress that the two numbers agree to within 10 percent,” she says, but rough agreement is no longer good enough. “The error bars are certainly not overlapping, and there’s nothing obvious that could be causing the difference.” To ferret out any nonobvious problems, she is developing a new type of distance measurement using red giant stars as reference points. At the same time, she is running a double-blind experiment to reanalyze all of her existing data for bias and mistakes. Cosmologists on both sides are also looking to outside groups for guidance. So far, those referees are only deepening the mystery. A University of California, Los Angeles, study that looks at how light is bent by distant galaxies gives a Hubble constant of 72.5, close to the distance-ladder result. Meanwhile an equally convincing study looking at how primordial sound waves affect the distribution of galaxies in the modern universe gives a constant of—you guessed it—67. Calculations of the Hubble constant anchored to the sound horizon consistently give a lower number than ones based on observations of stars and galaxies—and nobody knows why. There is one way all of the measurements can be correct, and that is if something is wrong with scientists’ interpretations of those measurements. Knox notes everything we know about the origin of the sound horizon depends on a theoretical model of how the universe behaved during its unseen initial 380,000 years. If the models are wrong and the size of the sound horizon is different than what they predict, that adjustment would change all of the numbers derived from it, including the Hubble constant. “If there is a cosmological solution, it has to be one that results in a smaller sound horizon,” Knox says. Shrink it by just 7 percent, and all of the studies happily agree with one another. The problem is, it is not at all clear what could account for such shrinking. In almost every other way, the model and the observations fit together tightly. “It’s been really hard to think of an answer that explains everything perfectly. It will have to be something complicated, because we’ve tried all the simple things already,” says Marius Millea, a researcher at the Berkeley Center for Cosmological Physics and one of Knox’s co-authors. He notes it is much easier to tick off the things that do not work: Undiscovered kind of neutrino? Nope. New type of interaction between photons? Uh-uh. They all conflict with the data. The most convincing explanation, in Knox’s view, is that the very early universe was expanding slightly faster than expected. If so, it would have cooled more quickly and frozen the sound horizon in place a little sooner. Then the sound horizon would be smaller than the one theorists have plugged into their models, and—problem solved! Or rather, then the problem is kicked down the road again, because now you need some explanation for what made the early cosmos take off more quickly. Knox has his suspicion. “Potentially where this is leading us is to a new ingredient in the ‘dark sector,’” he says, referring to cosmologists’ catch-all term for invisible components of the universe that do not interact with radiation in any way. Researchers already invoke dark matter to explain galactic motion and dark energy to account for the universe’s accelerating expansion. The divergent measurements of the Hubble constant may be the first sign of the existence of a third dark component, Knox argues—a “dark turbo,” perhaps, that added to the energy of the early universe, hastening its expansion and changing the pitch of its sounds. A related possibility is dark energy has more than one form, or changes over time in complicated ways. A recent study of 1,598 distant quasars using NASA’s Chandra X-Ray Observatory offers intriguing, if preliminary, evidence for the latter interpretation. It may seem like cheating to invoke something new and unseen to explain away a confusing result, but Knox looks at the situation the opposite way: The Hubble constant conflict may be bringing into view an aspect of the universe that had completely eluded detection until now. And he does not see anything strange about there being multiple kinds of dark elements out there. He points out the visible part of the universe contains many different types of particles and forces, and asks: Could not the dark side of the universe be complicated as well? At any rate, this is not a philosophical debate but a concrete scientific question. New observations of the early universe by the South Pole Telescope in Antarctica and the Atacama Cosmology Telescope in Chile will further probe the sound horizon. Knox is also part of a proposed next-generation ground-based project called CMB-S4 that intends to map the polarization of the microwave sky with great sensitivity. Further, Freedman is nearly finished with her comprehensive data reanalysis. Studies of gravitational waves will provide a completely independent way to assess the true Hubble value as well.